Why pay designer prices for a chunky chain and ribbon necklace when you can make your own for under $10? 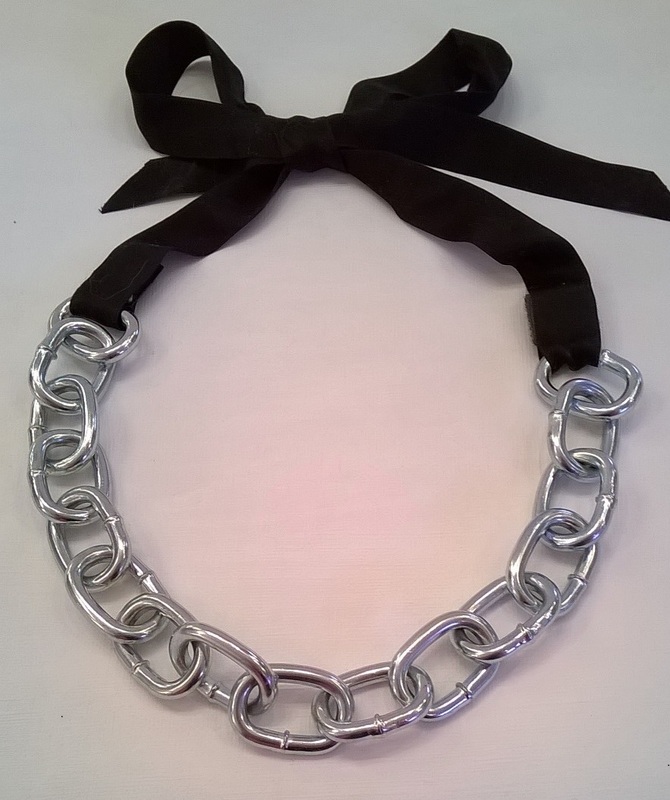 I was inspired to combine the statement necklace chunky chain trend and ribbon trend after seeing a Michael Kors chunky chain necklace priced at an outrageous $700 and several designer statement necklaces with ribbon ties, some priced at over $1000. Good grief! I already had black silk ribbon and Velcro on hand, so I only needed to purchase the chain, which I found at my local Home Depot for $1.10. This type of chain is normally sold by the foot, and it's available in any home improvement or hardware store, where you can have it cut to any length you need. Ribbon and Velcro are available at fabric stores, craft stores, and Walmart. To make the necklace, cut ribbon in the middle making two pieces of equal length, loop end of ribbon around end of chain, attach with Velcro, trim ribbon ends, try on, and tie ribbon in a bow at the back of your neck. Voilà! Now you have your own designer chunky chain and ribbon necklace for under $10. 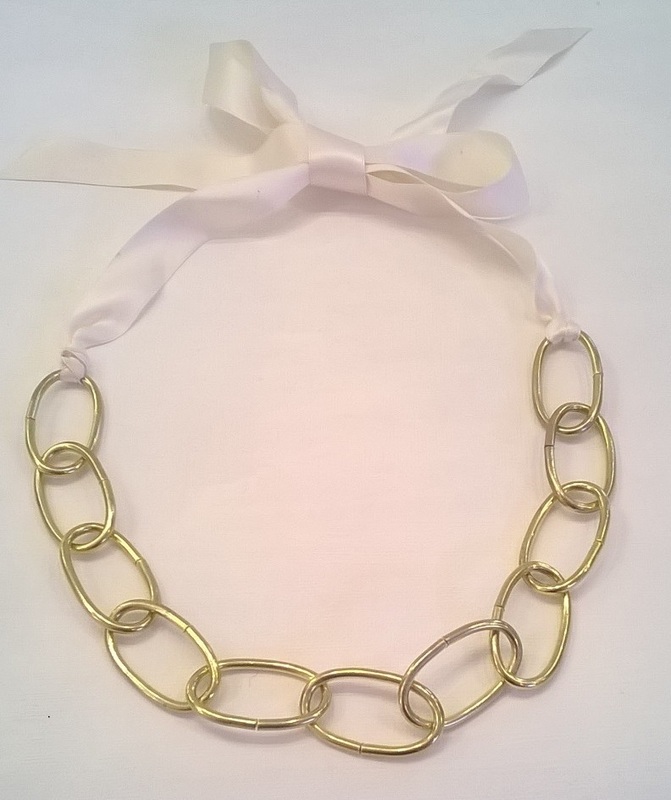 Here's another easy idea for a DIY chain and ribbon necklace. Like our chunky chain and ribbon necklace, this DIY chain and ribbon necklace will cost only a few dollars, and you can use materials from your local hardware store and Walmart. No special crafting or sewing skills are needed. 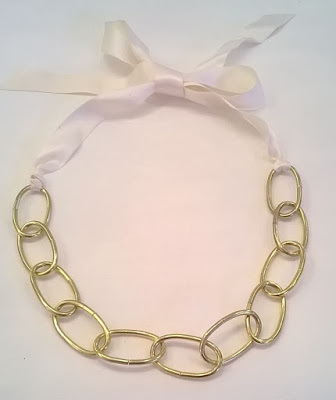 To make the necklace, cut ribbon in the middle making two pieces of equal length, tie ends of ribbon around ends of chain with a couple of knots. Now poke the ribbon ends back through the knot with a small blunt instrument and cut the ends close to the knot. 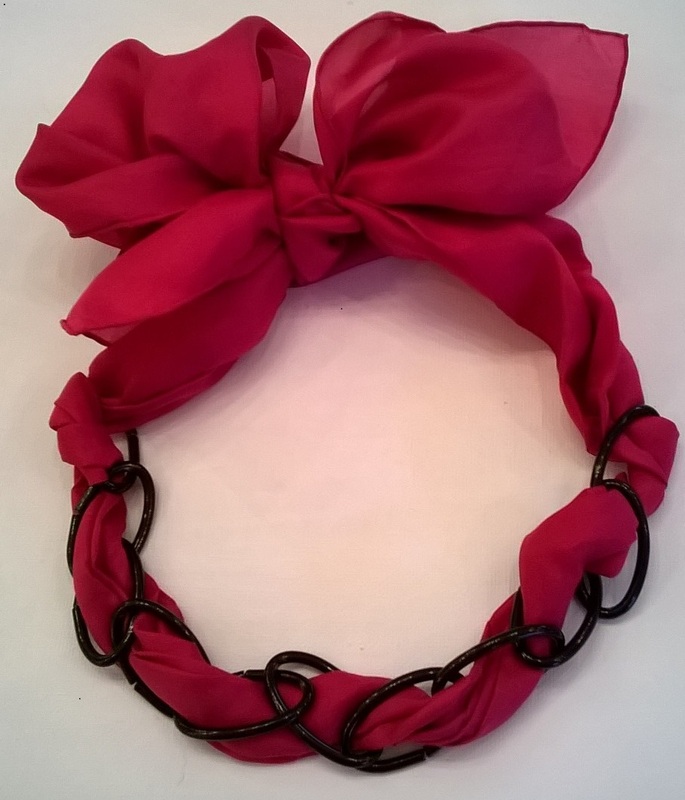 Trim ribbon ends, try on, and tie ribbon in a bow at the back of your neck. Now you have your own chain and ribbon necklace for under $10. To make the necklace, thread the scarf over and under through the chain links and then arrange the chain so that there are equal lengths of the scarf on both sides. Loop each scarf end back through the chain end to hold it in place so that the chain doesn't slide back and forth when you wear the necklace. Now tie the scarf in a bow at the back of the neck, and you have a chunky chain statement necklace that didn't cost a small fortune. Here's a variation if you want an asymmetric look. Make one end of the scarf longer than the other, loop scarf ends through chain ends to secure, and then tie the bow at the side front. Très chic!